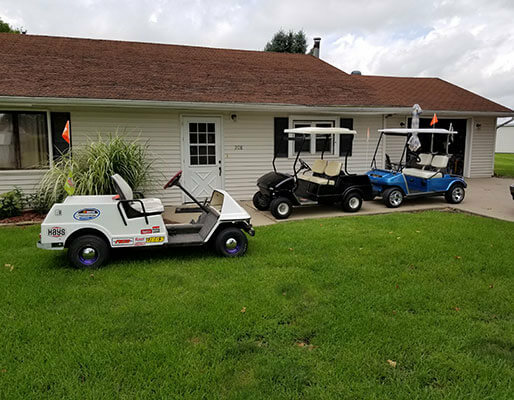 Check out these amazing customer rides! 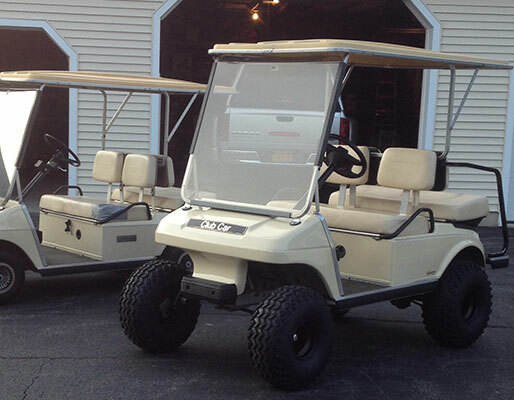 We always love seeing the custom golf carts you're creating with our parts & accessories. 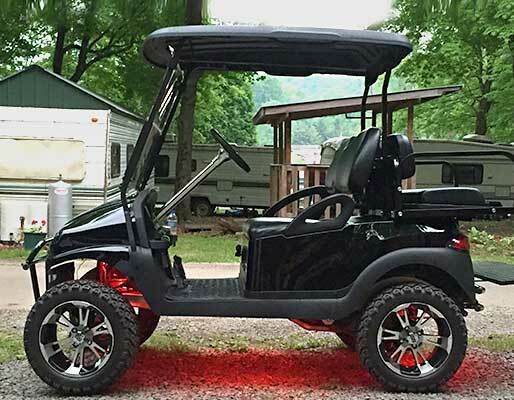 Want to see your golf cart featured here? We'd love to hear from you! 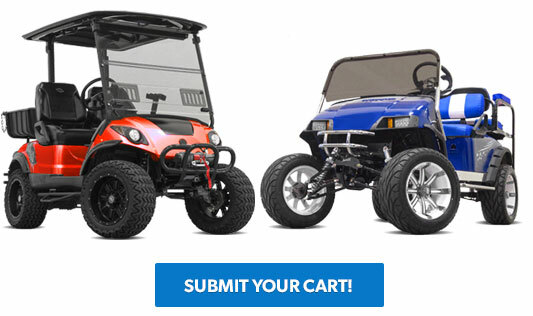 Submit Your Cart Today & get a coupon code for 5% off your next order! 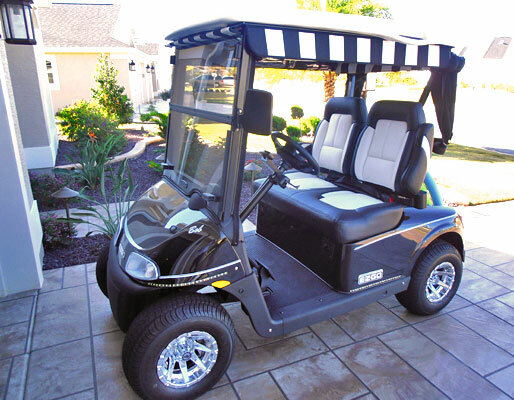 We'd love to feature your golf cart here, for all to see! Send us a photo and a little information, and we'll show it off right here! New submissions are added weekly. 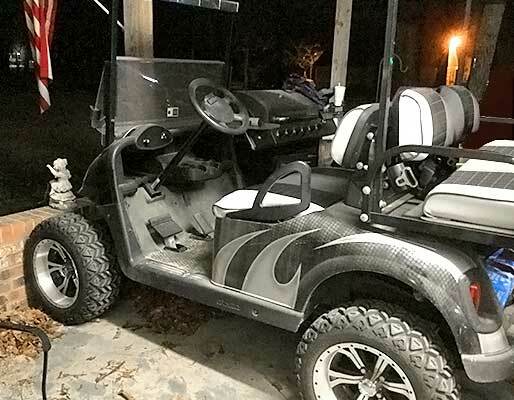 Bet it looks great on the course! Pairs great with the Camaro, Daniel! Wood accent - nice touch! They look great, too, Tom! Glad we can help keep it running smooth for you, Ken! It's looking great, Jeff! Can't wait to see the next post. Keep up the good work, Chuck! 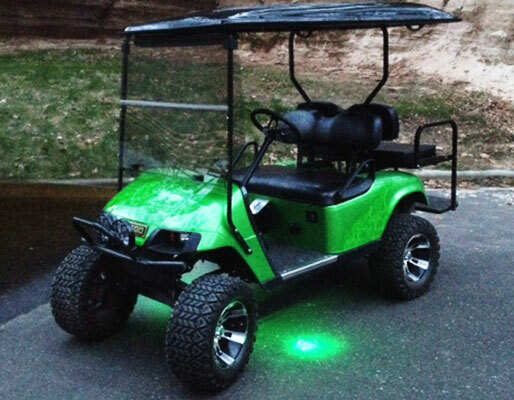 Cart looks mean and awesome, Larr! Thanks for sharing! Congrats on the new Onward - looks great! Can't wait to see it with new accessories! 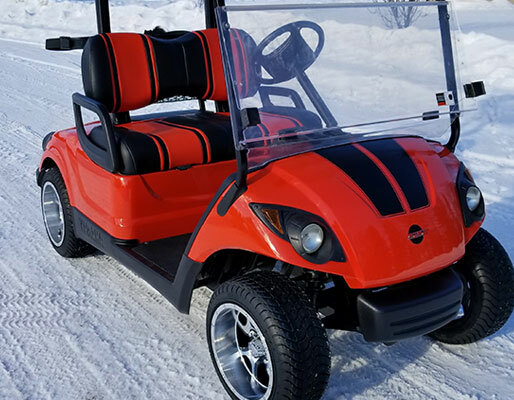 Way to Go with the EZ-GO! Wow! This looks so cool! Love the paint job. 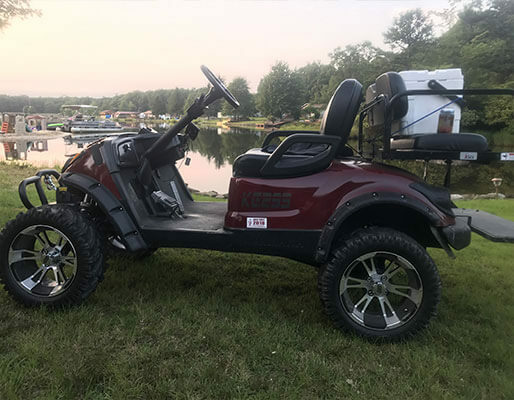 And that custom trailer - that's a great idea. We're so happy your service experience was fantastic. 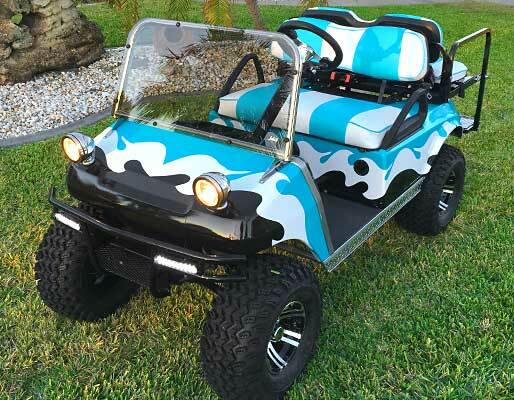 The cart looks amazing! 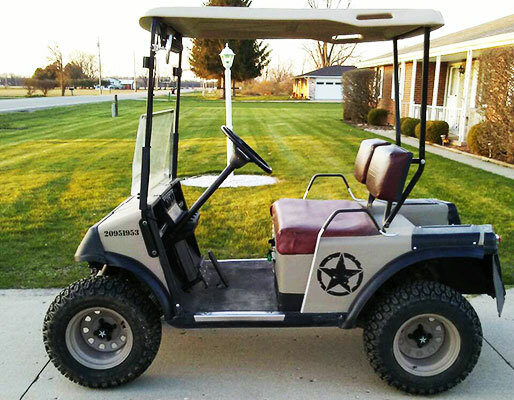 Thanks for sharing this amazing cart customization work, Mike. You, John and Sedam Upholstery have created a masterpiece. 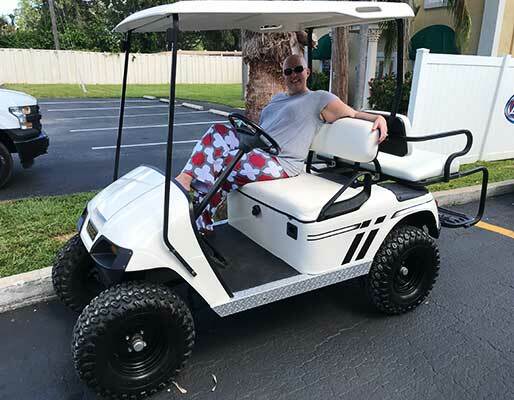 You have a great looking cart, David! That color combo is always a winner. The upgrades are awesome and we are happy that we could help! Thank you for being such a loyal customer! 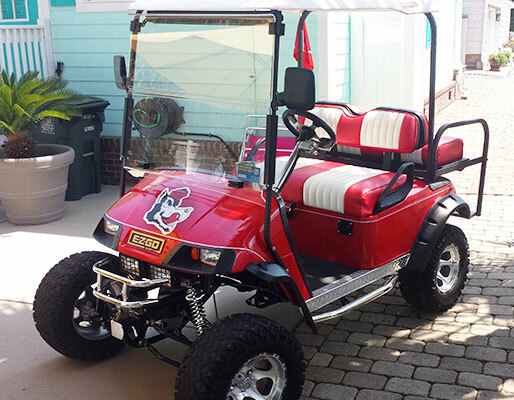 We love the upgrades and the custom paint job! Thank you for sending this in, Kevin! 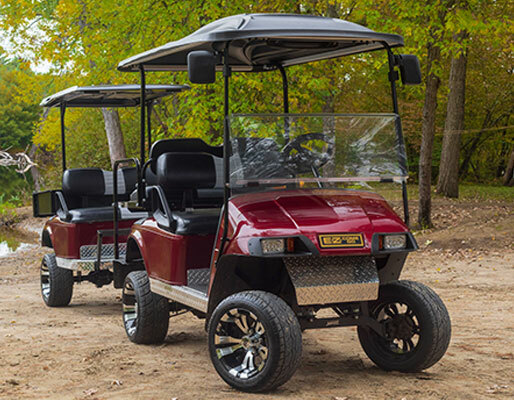 We're always happy to help in any of your golf cart needs! 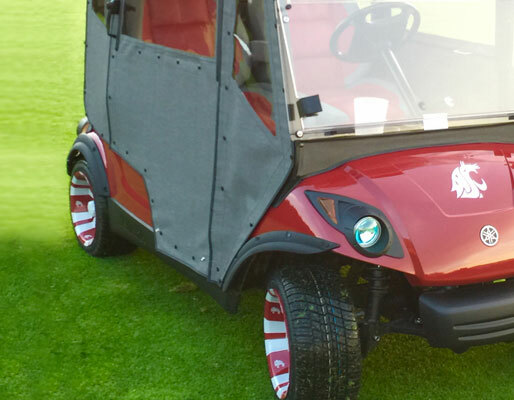 Good looking golf cart, Eric! Thank you for submitting this! 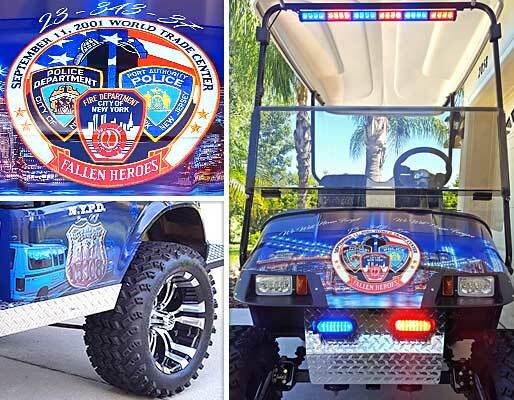 This cart looks great and represents the team well! 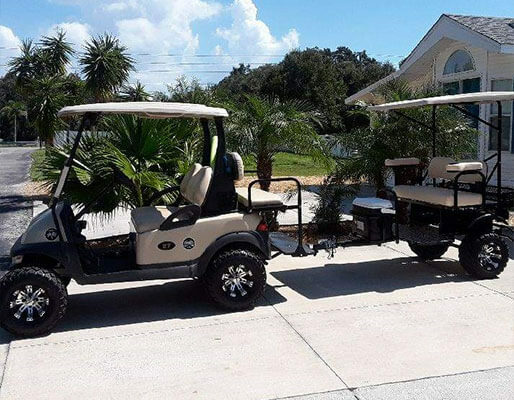 We're glad we could assist in making this cart all that it is! 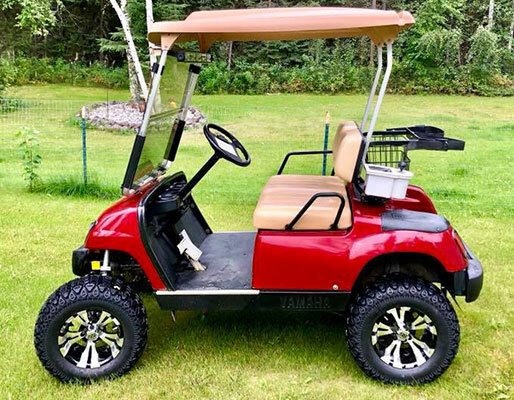 Great looking cart, Shaun! Thank you for submitting this to us! 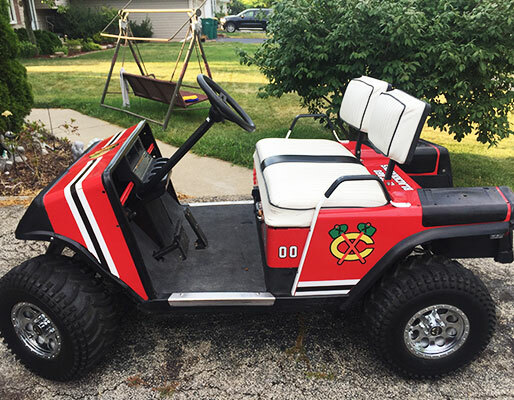 This is a great looking cart and I'm sure the Blackhawks would love it! THANK YOU for sending this in, Paul!! She is a beauty! 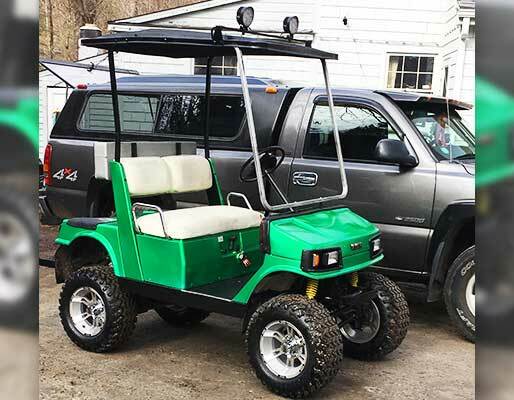 This cart is amazing! We love the attention to detail and the color palette. 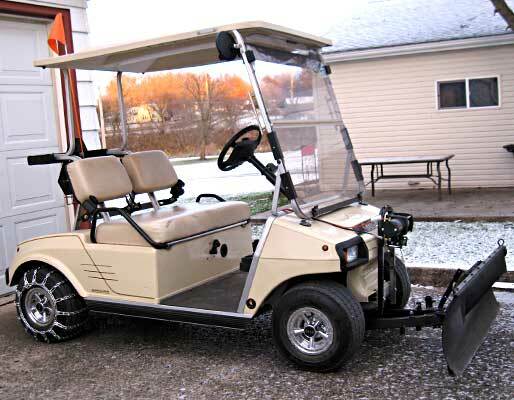 This is one mean looking cart! Great job, Tom!! This customization is perfect with these wheels. 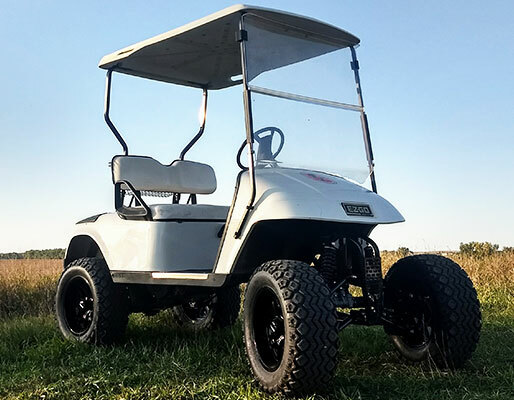 From top to bottom, it's a beautiful cart! 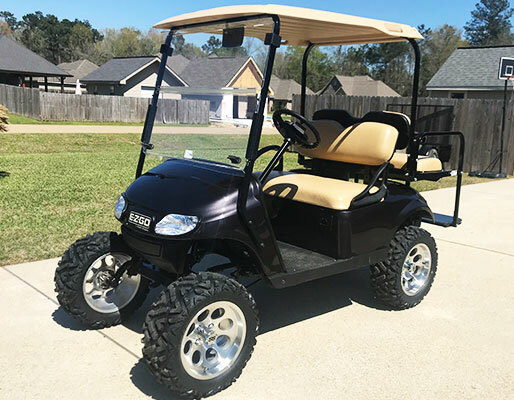 This custom cart looks great! Thank you for sending this in and sharing! Thank you for being such a loyal customer, Alan! 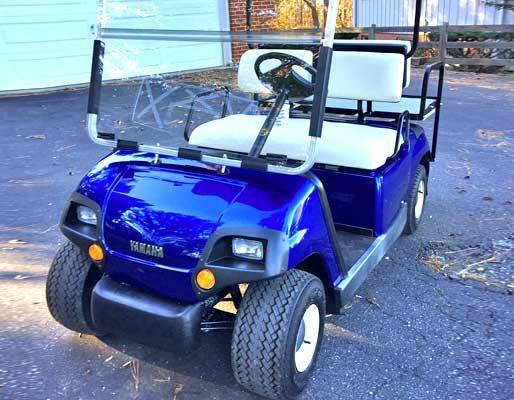 Your cart looks great!! The lift, wheel, and tire combo looks great!! Dave, your friend is lucky to have your help! 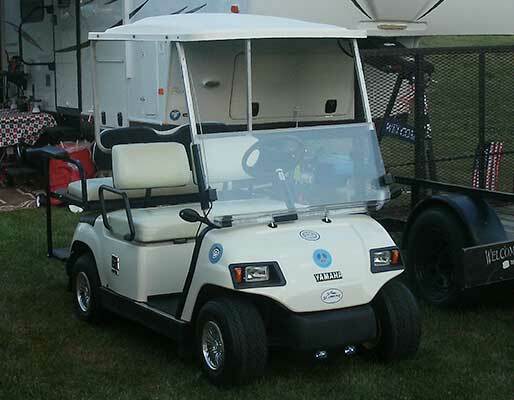 This is a great team cart! 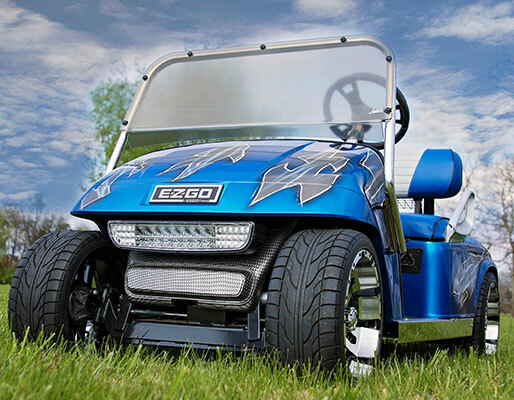 This is a head turning cart! Thank you for sending us this photo, Dean! 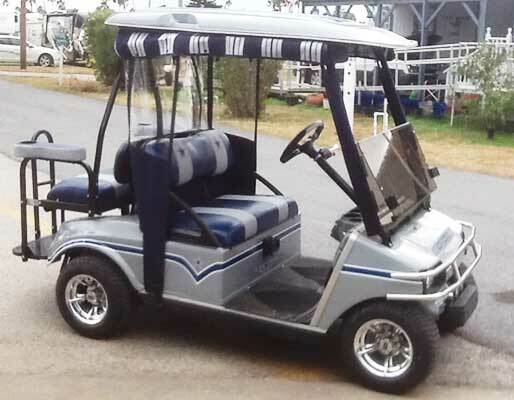 Golfing in style! 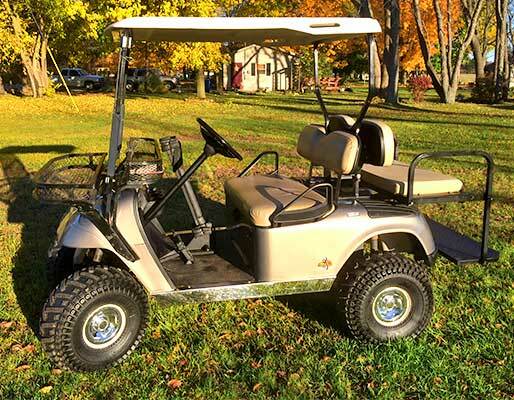 This not only looks good, but it also feels great to ride in with the heated seats and fan!! Great job, Ron! 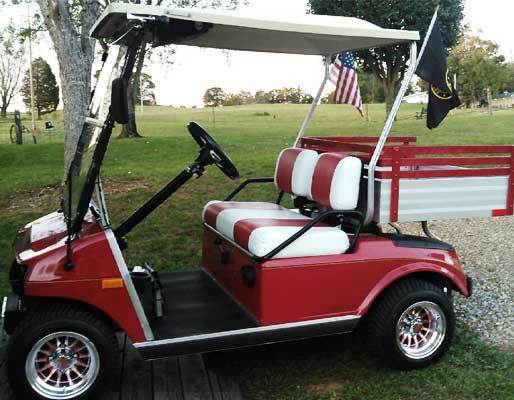 This is a cart that would make the Wolfpack proud! Go State! Great idea to get a cover to keep this beauty looking good at all times! The upgrades look really good and we're so happy that we could you help out with this project! 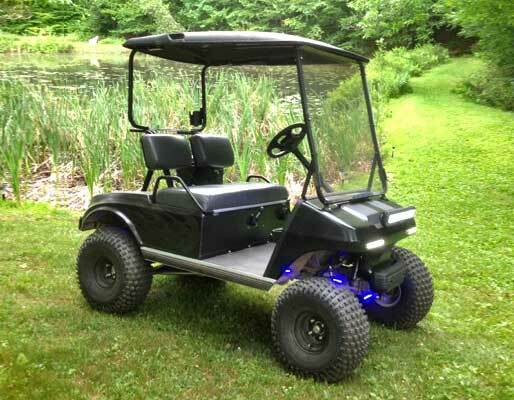 The modifications to this cart looks great! 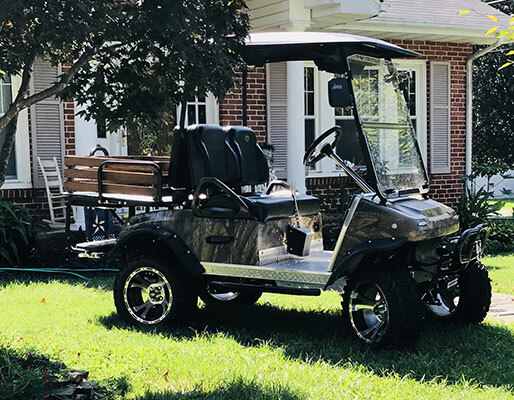 Thank you for sending in this photo of your cart! 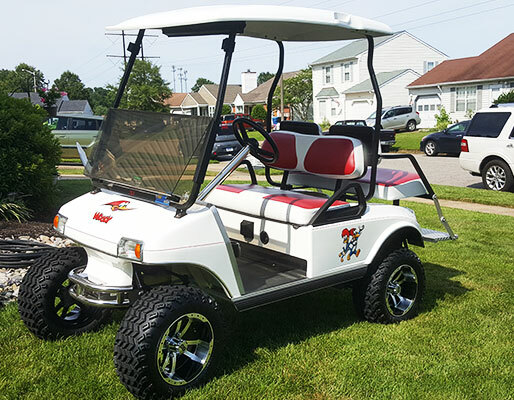 Gotta love Woody Woodpecker and gotta love this cart!! Great job, Gregory. 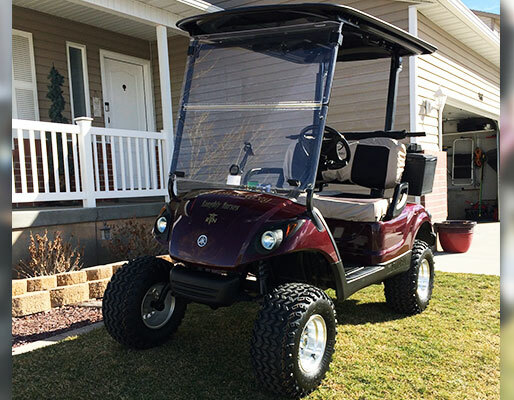 We're happy that we could help you out with this build! 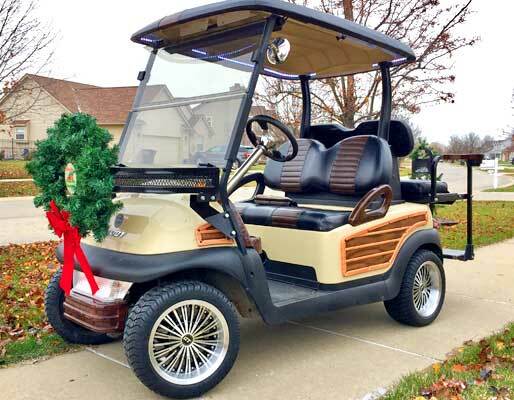 People will definitely notice when you drive by in this cart! This looks great and sounds great! 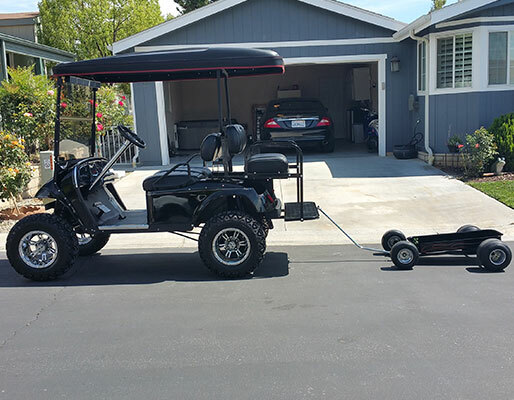 No this is the type of father and son project I would want to do! You guys did great! Andy, you did a great job with this cart! 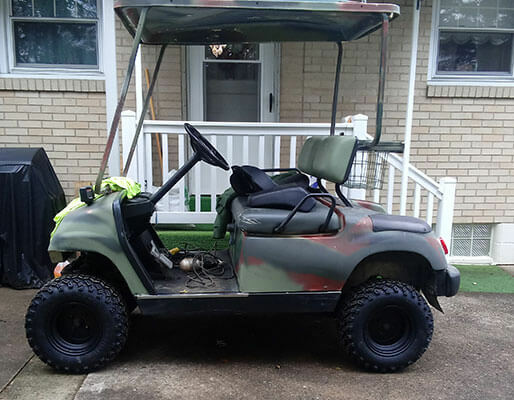 Thank you for sending this in and being such an awesome customer! 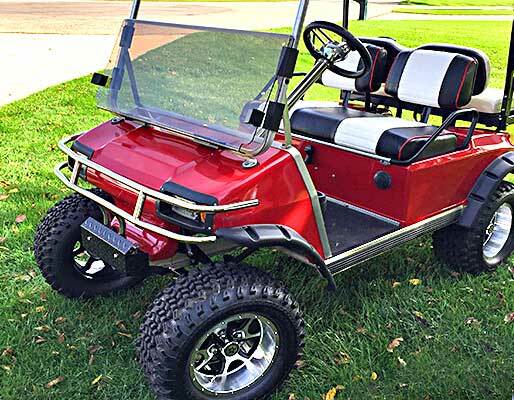 This is an amazing looking cart! Thank you for sending in this photo, Pete! Amazing work, Julio! 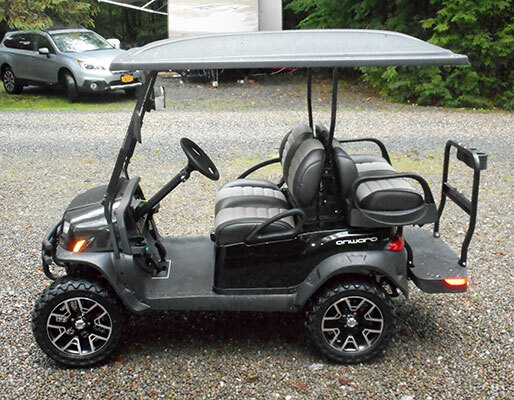 This cart is ready for the road and doing it in style! 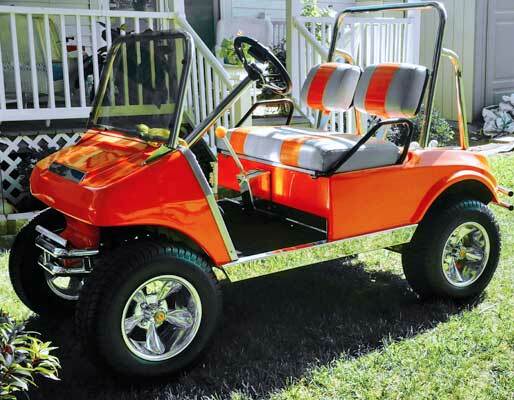 From top to bottom, this is one sweet ride!! 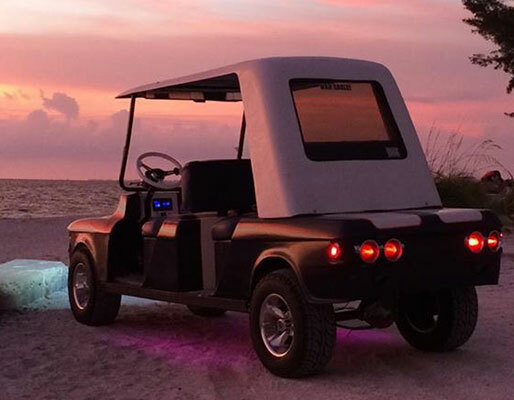 We love what you did with this Club Car. Thank you for being such a great customer! WOW! 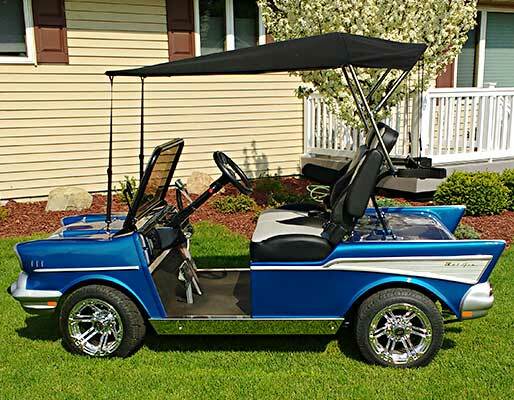 We love this cart! The all black with the brown leather seats looks amazing! 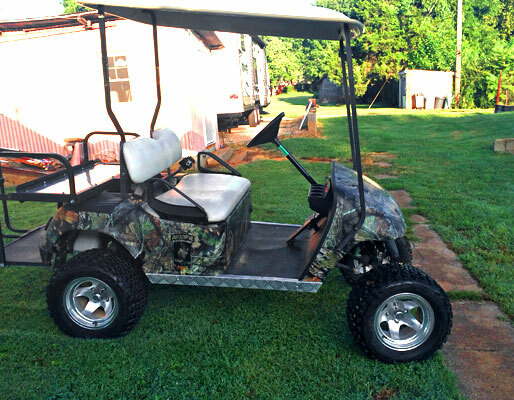 We know that heads are turning when you ride by in this! 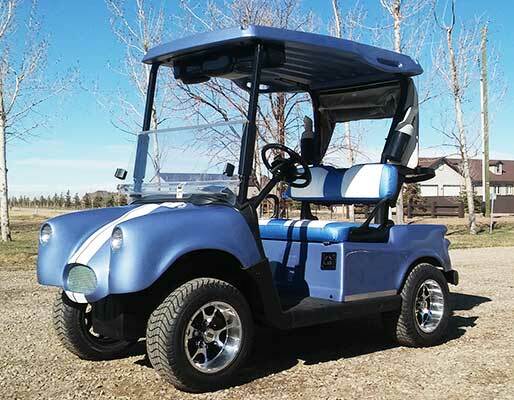 We are very happy that we could help you with this beautiful golf cart! 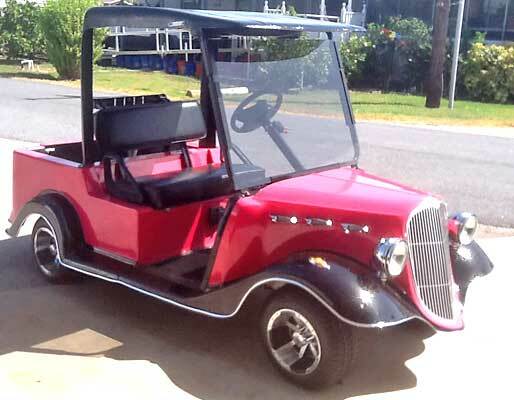 This is one sweet ride! We love the colors and all of the details. Great job, Bobby! 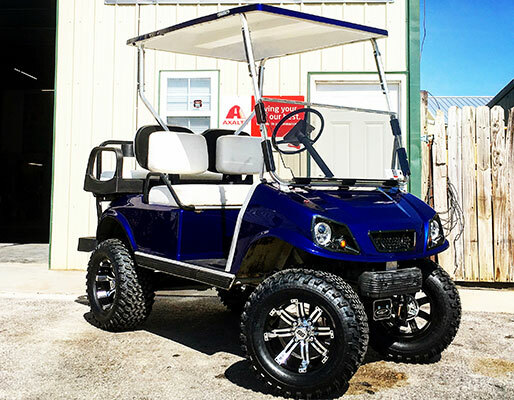 This is one beautiful cart! You did a great job on this one, Randall! Luke, you did a great job with this rebuild! 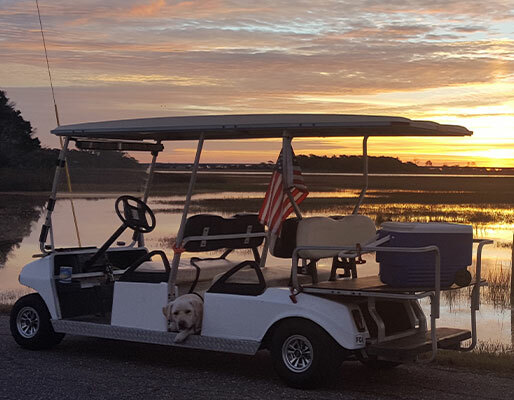 We always love to see what our customers' carts look like! 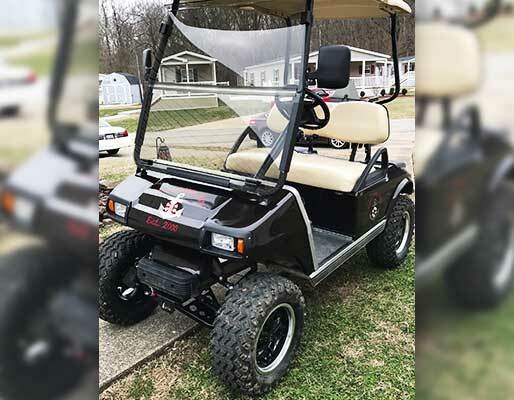 “I took this 1988 Club Car DS and totally rebuilt it from the frame up with a new body, a lift kit from Buggies Unlimited, a 400 AMP Alltrax controller and 23 1/2" tires. 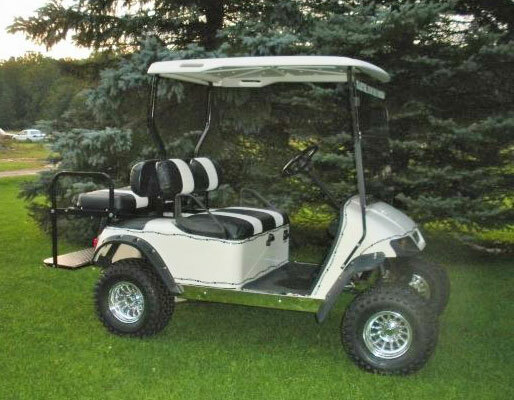 Rear seat and windshield also from Buggies Unlimited. 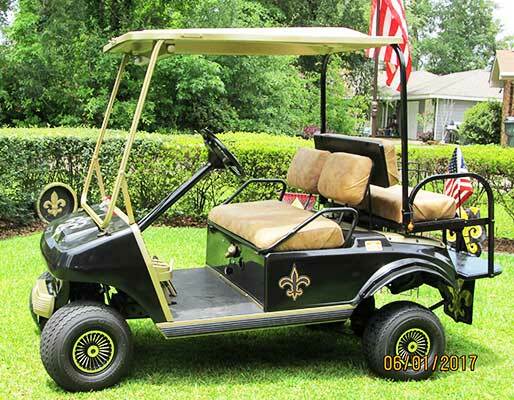 This sweet ride comes from good ole Louisiana! 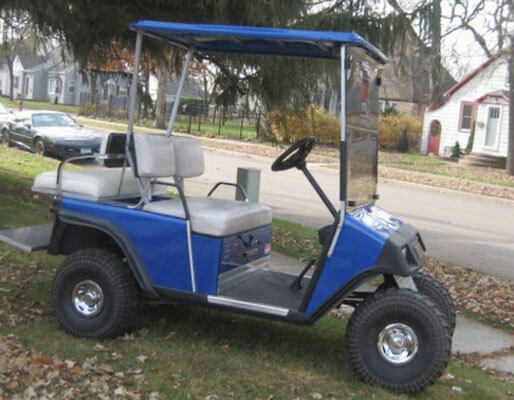 Can't miss this cart when it drives by! This look great Justin! 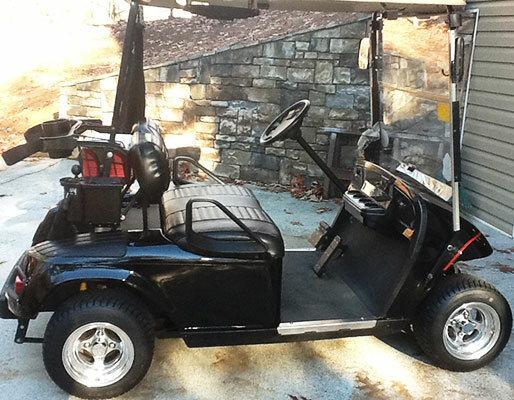 We are glad we could help you upgrade your golf cart. Greg, you did an amazing job! Built For the Tough Stuff! 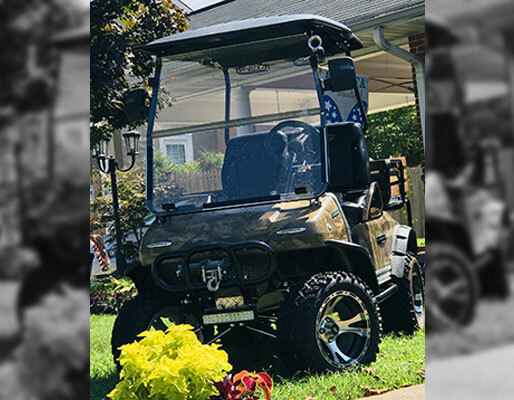 Trent's ride features a host of Jake's™ off-road products, including a long travel lift kit, tubular bumper, shifter, and hydraulic disc brakes! The upgrades don't stop there though - the interior includes a sport steering wheel and rear seats! 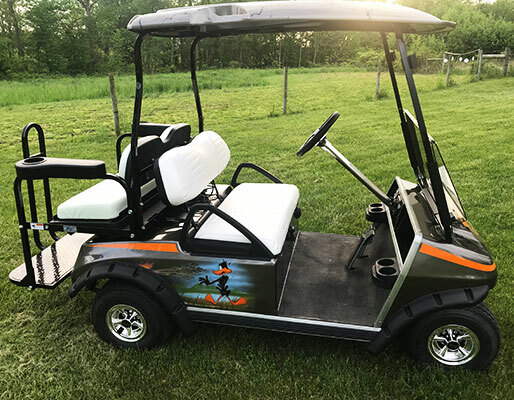 Kathleen's golf cart is styled around a classic 'Woody' theme, is fully decked out with burl wood trim, and sports a set of 12" Swagger wheels to complete the look! 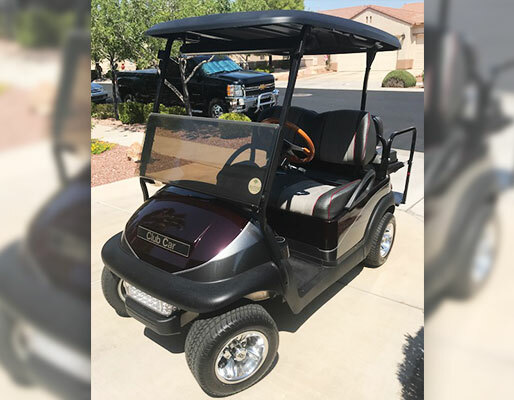 Bob has added several street-ready parts to his golf cart, including a rear seat, windshield, lights, and new wheels. 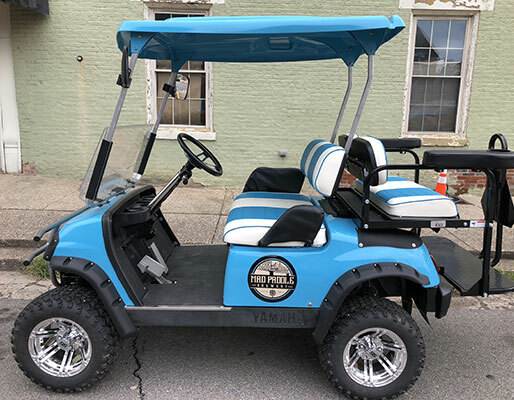 The bright white seats and wheels really look great against the deep blue paint! 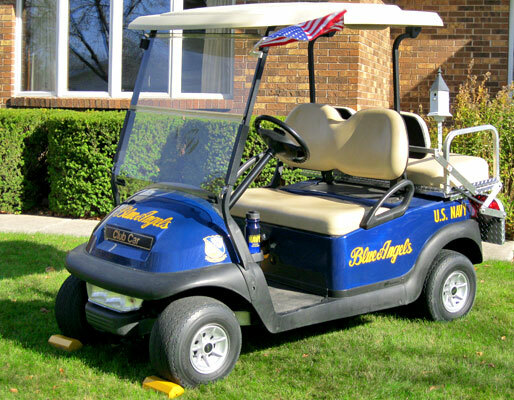 Dave has decked his cart out with a full U.S. Navy Blue Angels theme, and it looks stunning! 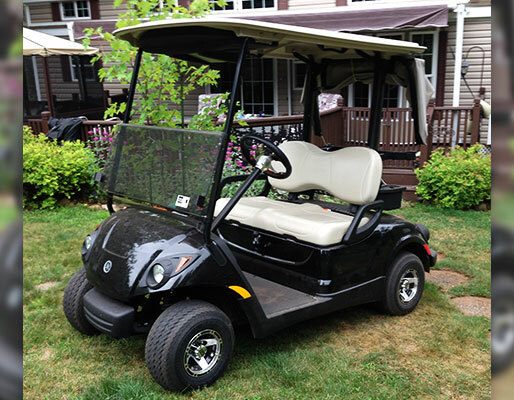 We helped Dave with some new electrical components to keep his cart running in top shape. 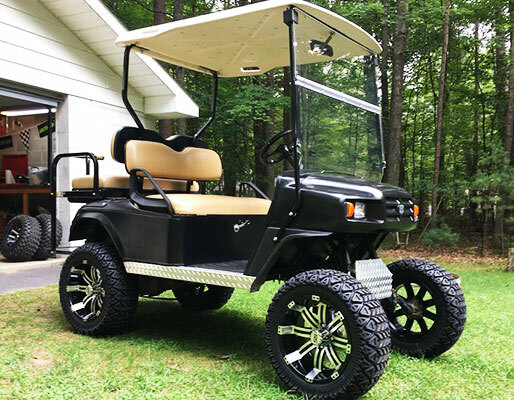 Mike's golf cart can handle tough terrain, thanks to the GTW lift kit, and 10" Evader wheels with chunky Desert Fox tires. 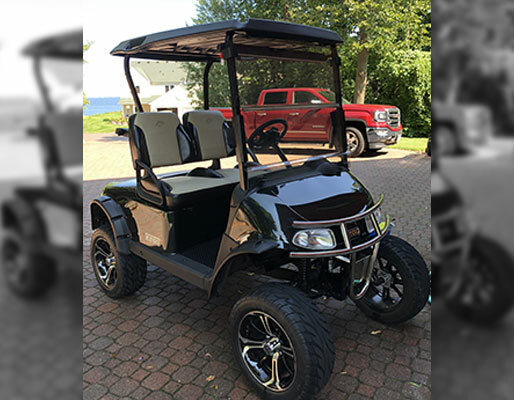 Craig has added multiple outdoor sports upgrades to his cart, including clay baskets, a gun rack, flip flop rear seat, a windshield, and polished hub caps to complete the rugged outdoor look. Mike also used our engine rebuild service when it was time for an overhaul. 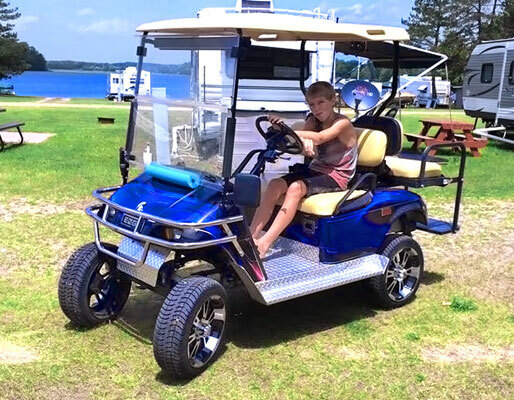 Larry's ride is perfect for transporting up to four people around the campground in style! 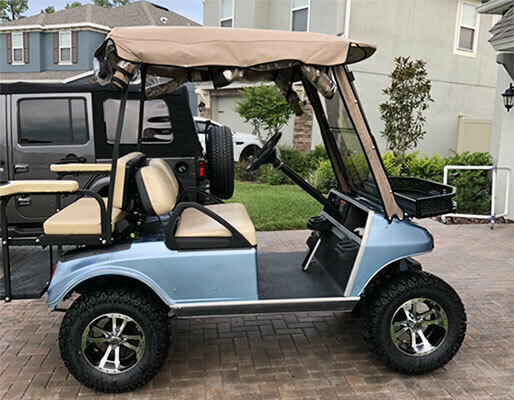 The upgrades list is extensive, and includes matching rear seats, loads of diamond plate accents, a lift kit, and some enormous 14" Yellow Jacket wheels with low profile tires! 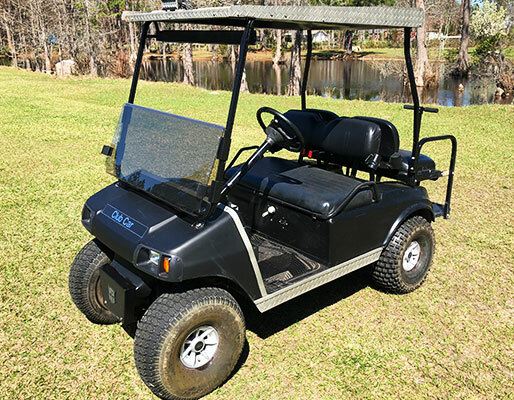 This clean E-Z-GO Freedom RXV is owned by Bob J. in Florida, and looks brand new! 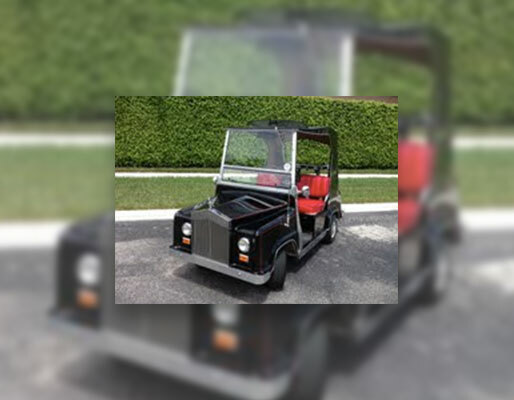 We carry a wide selection of parts, accessories, and upgrades for this model golf cart. New Wheels Gave it Swagger! 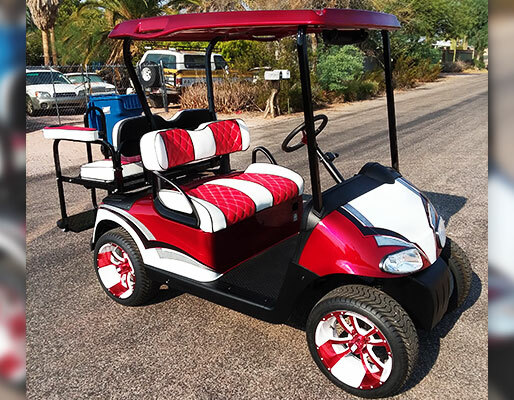 Robert found the perfect wheels for his ride - White & Red Vampires! 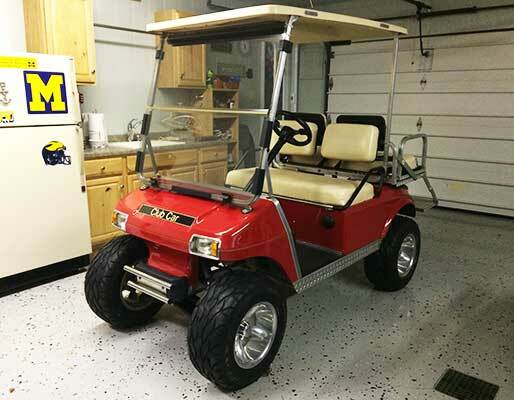 Rusty's in the process of fixing up this 2006 Star golf cart, and is currently in the research & planning stage. We look forward to seeing some project updates in the future! 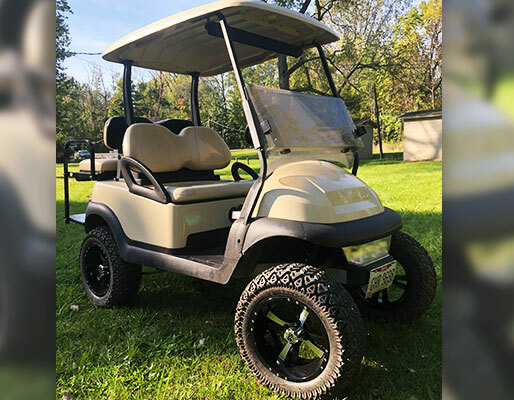 Thomas picked out a great set of mirror-finish Storm Trooper wheels for the bright green hot-rod golf cart he's building! Shod with street tires, they match the roadster style really well! 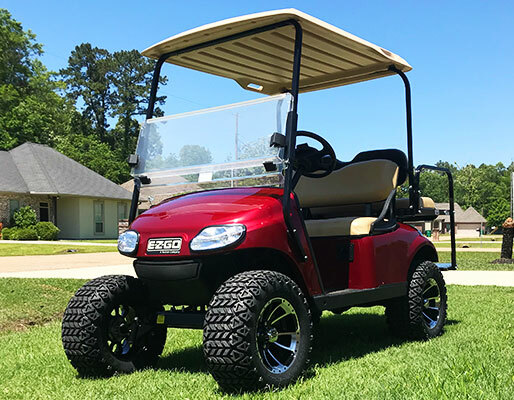 Tom added a lift kit, and a set of Black & Red Storm Trooper wheels on all-terrain tires which perfectly complement his super-sleek (and incredibly shiny) Black & Red Cart! 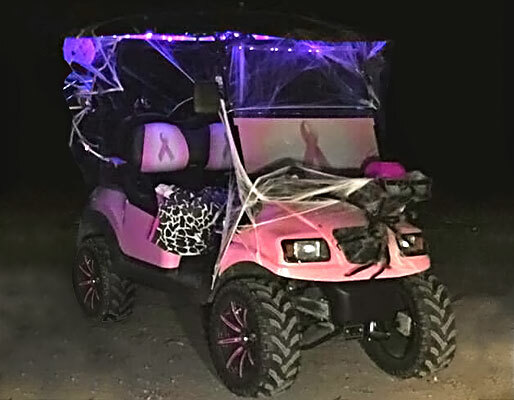 Kerry's uniquely pink golf cart is styled for a great cause. Here, it's all dressed up for Halloween and looking the part! 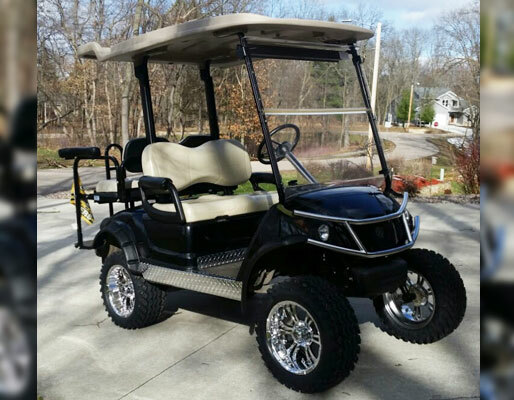 Dave's custom golf cart received a full suspension overhaul, plus new tires, wheels steering wheel and more! Really nice job, Dave! 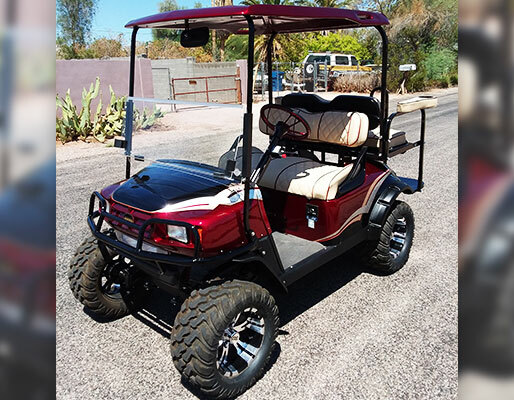 Mark's ride looks stunning in high gloss red with matching details. 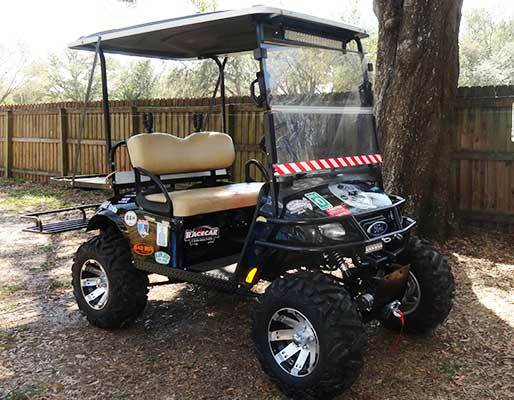 He's added a lift kit, wheels, new seats, and has some power upgrades planned! 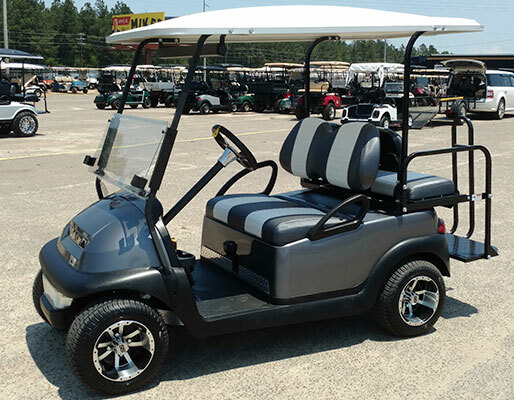 Roger's golf cart is fully decked out in a black, white and gray theme and really looks the part. 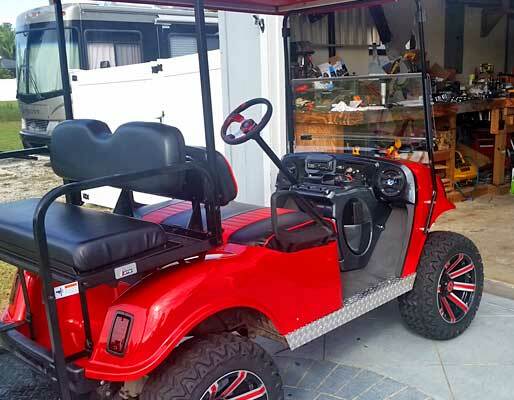 We helped Roger out with a cover to protect his ride when it's parked outdoors. 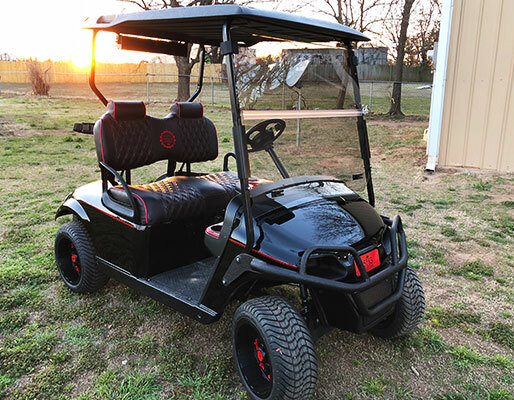 Mark's super-clean blacked out ride features stunning red underglow lighting, which we're sure looks incredible at night. 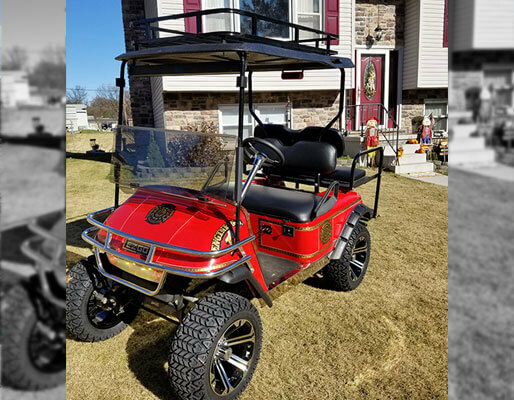 Tony has installed a lift kit and a tinted sport windshield on his outstanding dune-buggy themed ride. Great work Tony! 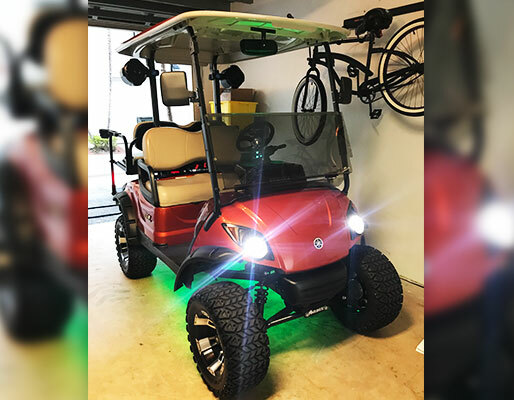 Mark's ride features some trick lighting details! Nice work, Mark. 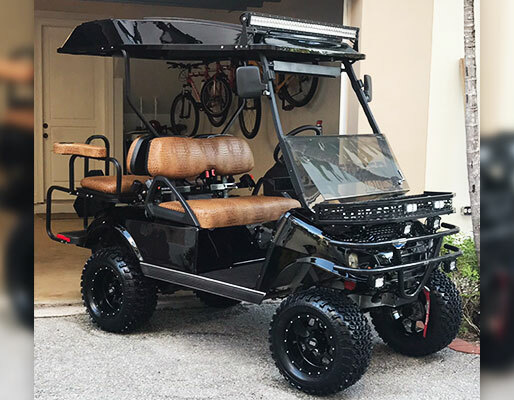 Jose's E-Z-GO is geared up to hit the trails with ease! 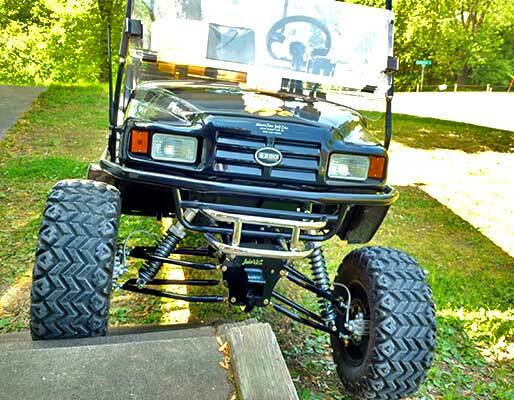 A lift kit and upgraded wheels & tires give it extra ground clearance, while a full set of guards protect it from scuffs and scrapes. 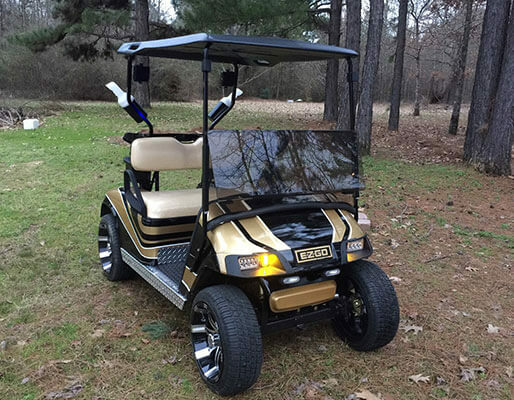 Charlie's cart looks fast even when it's standing still! 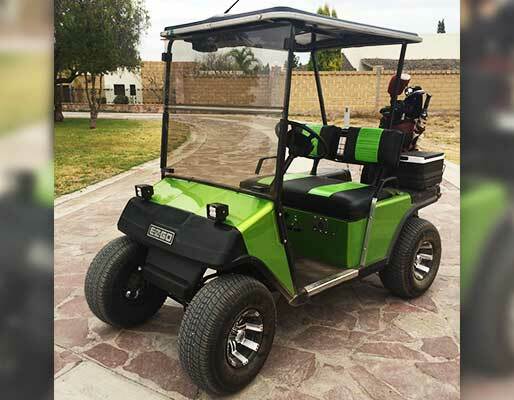 It's running a 48-volt system with a 550 Amp controller and 11hp motor, plus massive 2 gauge battery cables. Looking good, Charlie! 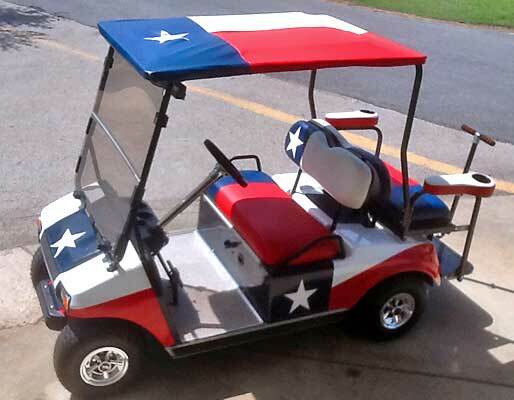 Billy's ride is as Texas themed as you can get! Really nice details, Billy. 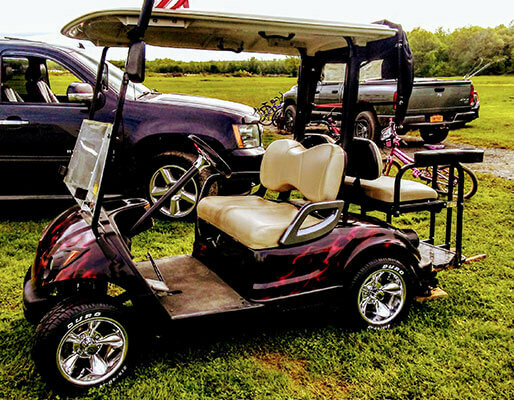 This custom truck cart is ready to cruise! 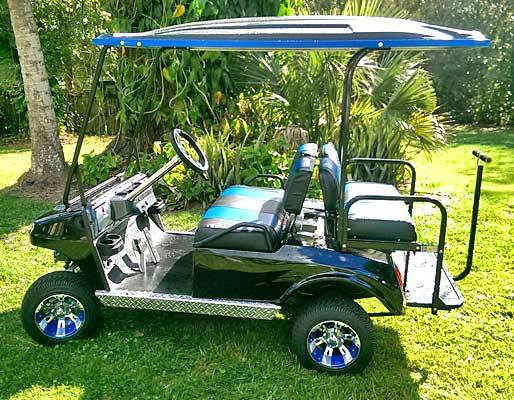 Skip's cart is decked out in a stunning black, blue and silver theme. 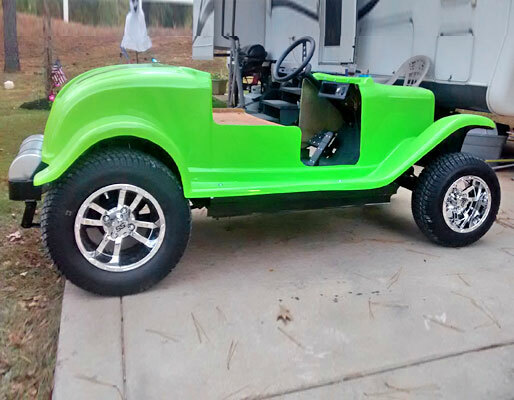 Doug's custom Jeep-bodied cart features a whole host of upgrades, and looks fantastic in the two-tone paint scheme. 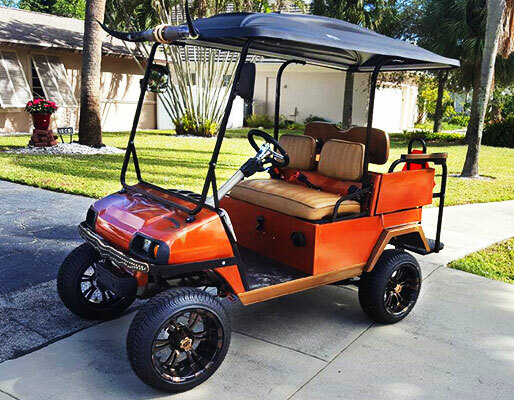 Don built this cart for a friend, and we really like the color matched theme throughout! 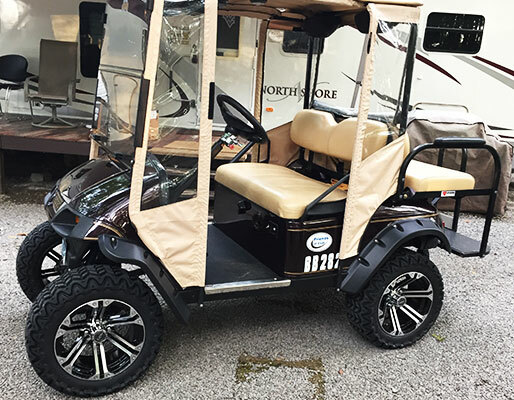 This golf cart's new chrome wheels and other upgrades have it looking fresh and clean! Great job, Ric! 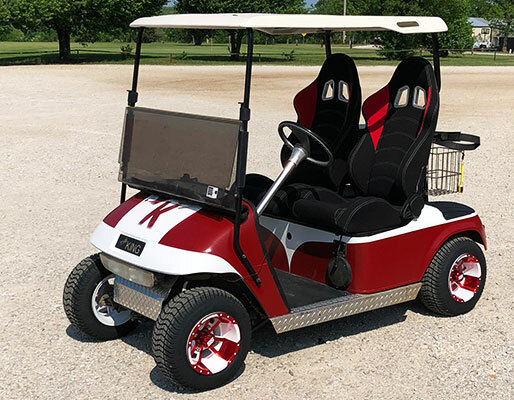 Lee has this cart looking great with chrome wheels, red details and awesome drag wagon! 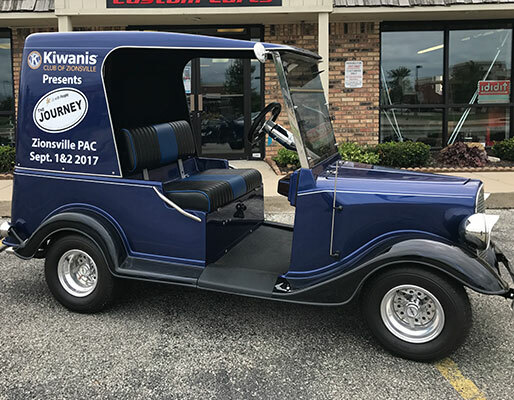 A great vintage inspired cart used to promote a great cause! 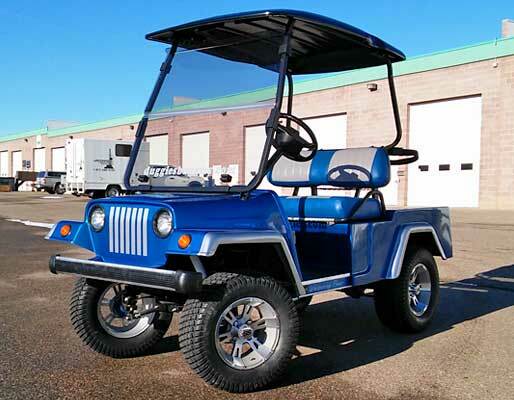 The blue & black seats and chrome wheels look great with this overall style! Red hot interior and awesome details! Black, Red, and Chrome! Oh My! 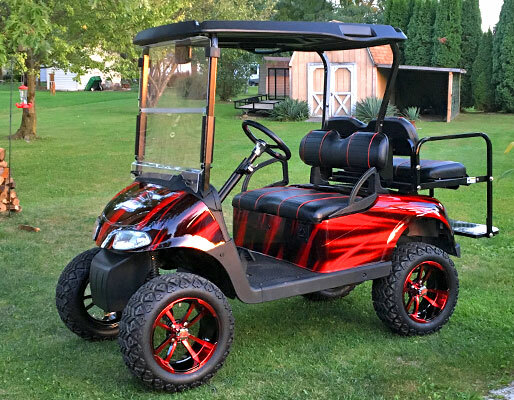 Jim has this cart looking sleek with a black and red theme, shiny chrome wheels and many other awesome upgrades! Thank you so much for your loyal business! Black & Gold. Go Saints! 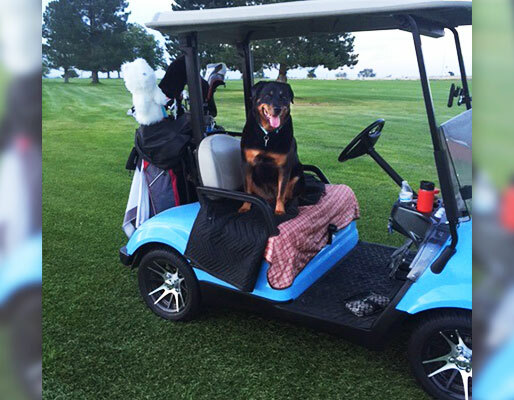 This cart almost saw the last of it's days, but Ira was there to save the day! 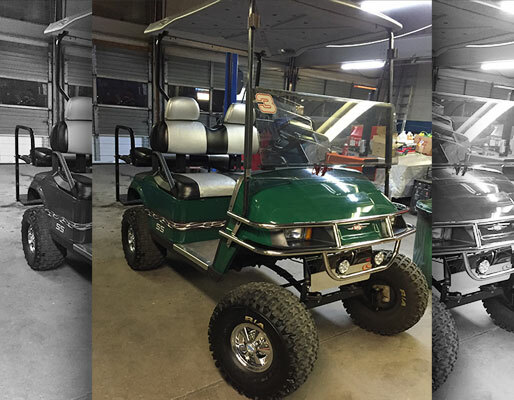 He gave this cart a second chance and it's looking better than ever! Ready to Cheer on the Dawgs! 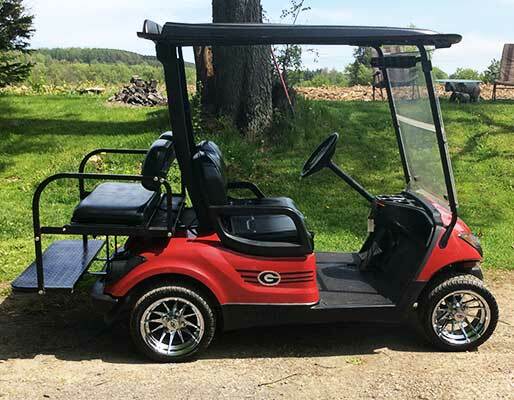 Rodney has this cart Georgia Bulldog ready! Blue and white seats to match the beautiful blue and white paint! Doug also added some shiny new wheels to top off the look! Great job! Justin did great with this build! 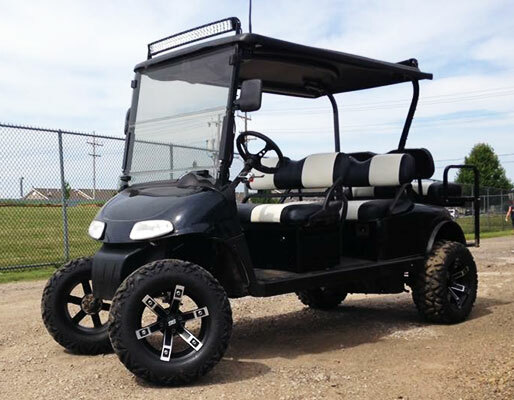 The all black with tan seats looks amazing! 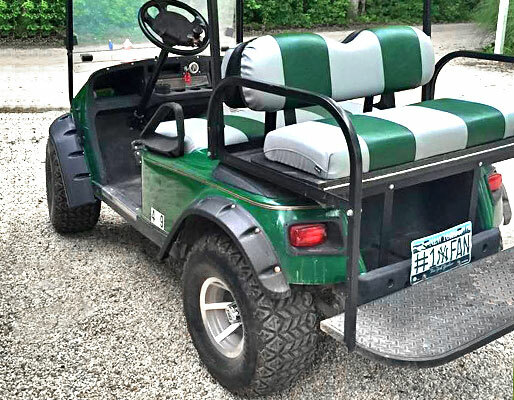 This cart was given a lot of TLC! All of these great upgrades have been combined to make one good looking ride! Awesome job, Gary! 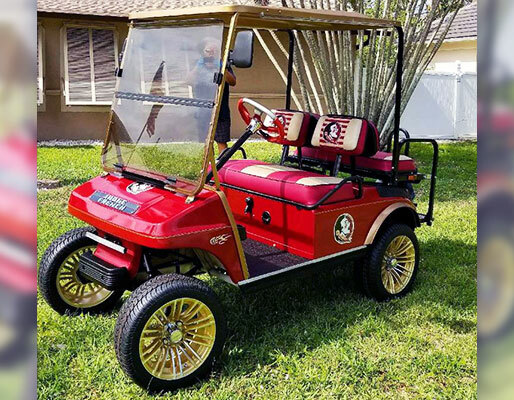 Edward's cart is on point! 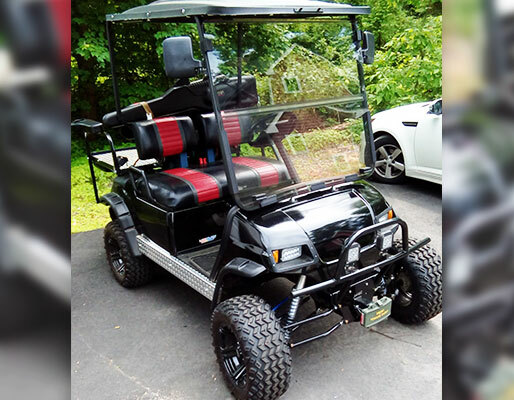 So glad we could help you take your ride to the next level! 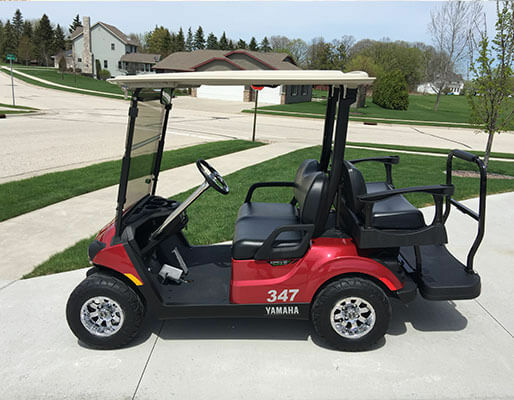 This Yamaha golf cart is looking great with all the new upgrades! Thanks for the great feedback Robert. We're happy when you're happy! Great job, Allen! 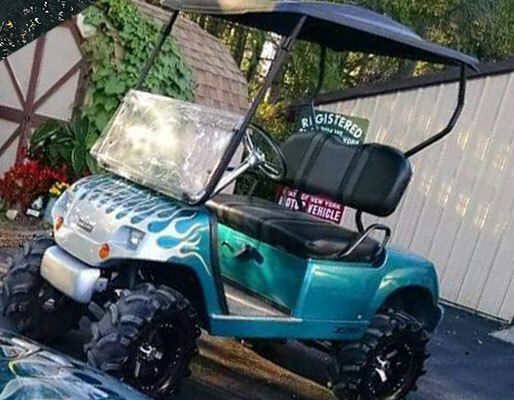 You definitely turned this into a unique ride! It looks amazing and we are very happy that we could help you out on this project! Rudy, your attention to detail is amazing! Great work! 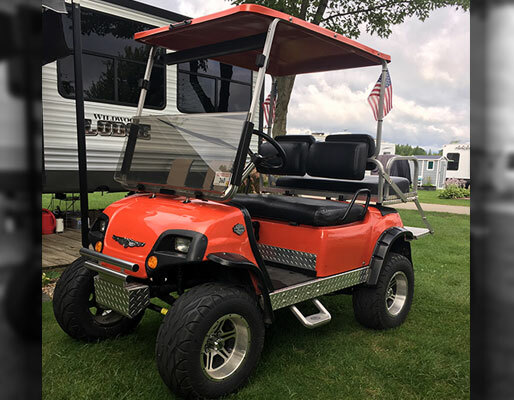 This cart is looking great, Rick! Chad, this is awesome! You have done an amazing job and totally deserve that trophy! Love the red and white theme! 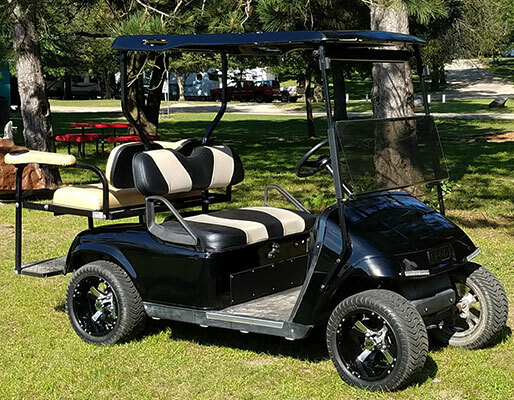 All these upgrades have come together to make one great looking cart! Great job, Roger! We're glad we could resolve that issue for you as well! 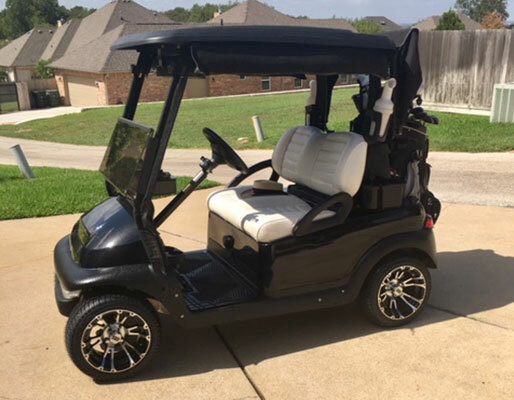 The white with black details and all black wheels looks great! 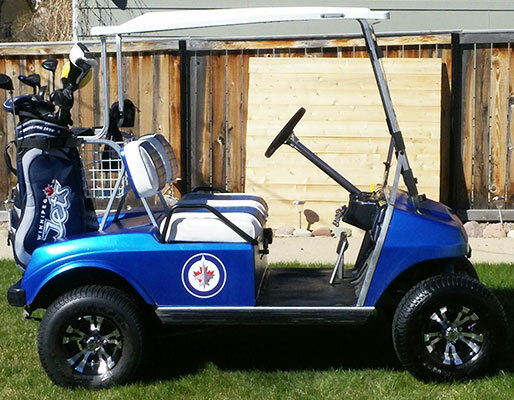 You have an awesome looking cart, Johanna! Thanks for sending in your photo! Tom, you did a great job on this one!! 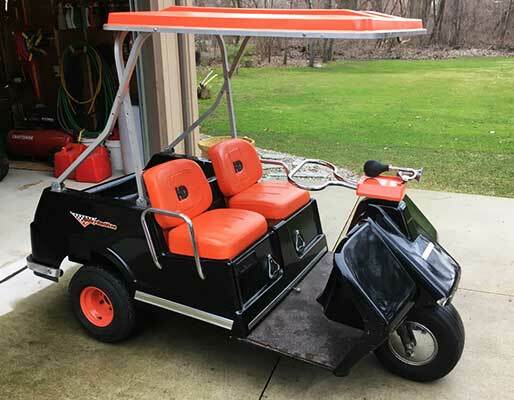 Tony, we love what you did with this cart! The tire & wheel combo looks great! 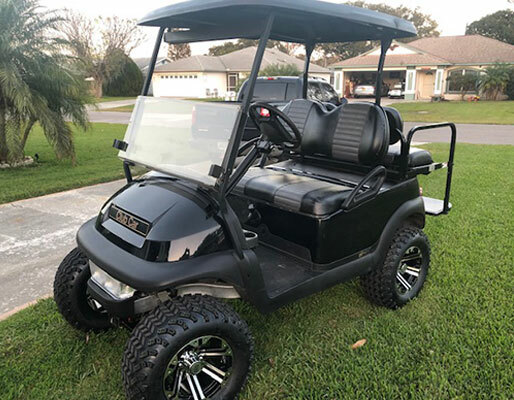 This cart looks great, Christopher! Thanks you for this submission! 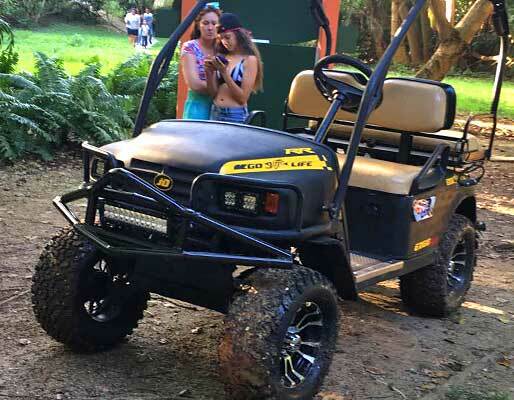 This cart went from ordinary to the talk of the whole campground! This is looking great, Tom! 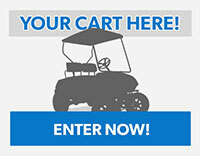 Thank you for submitting you cart! 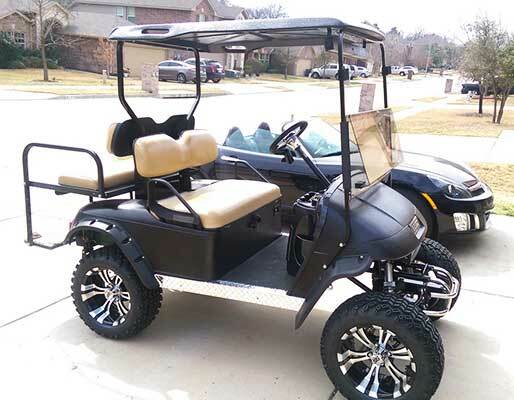 This Club Car is ready for some football tailgating at a Cowboys game!! This looks great, Billy! 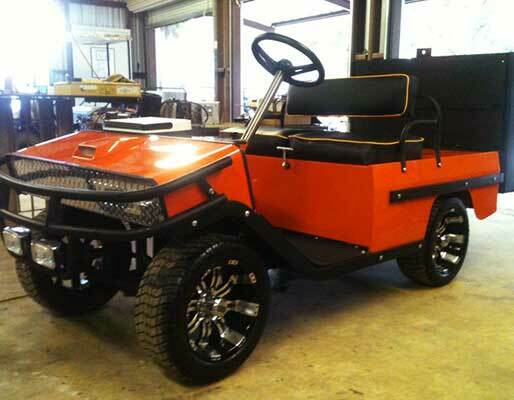 So much time and hard work went into this golf cart and it paid off! 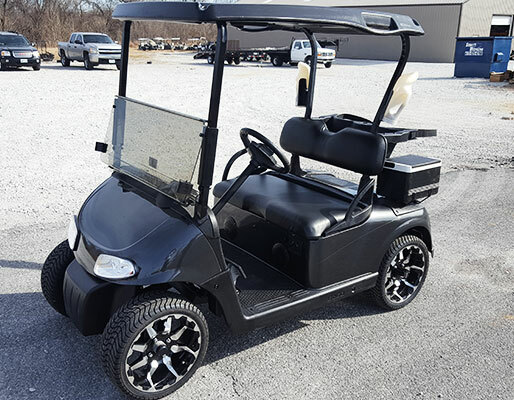 We had a great time working with you to get this cart exactly how you wanted it! 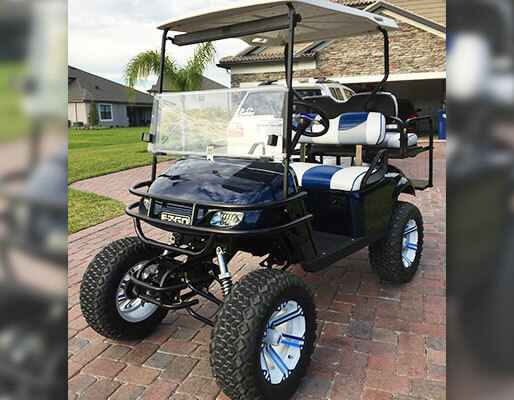 This cart from Florida is looking great with all of the upgrades that Jeffrey made! Awesome job and thanks for showing us your cart!